Imagine riding on backcountry trails, dodging tree branches and feeling the sun shining down on your back-all from the comfort and safety of your favorite fitness facility. 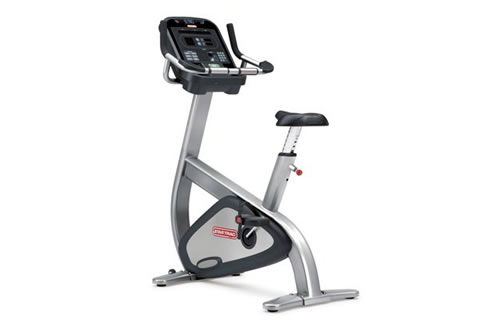 The Star Trac E-UBi Upright Bike riders now have the option to watch content from their own video iPod®s on a 15" Personal Viewing Screen (PVS) while working out. The E-UBi boasts iPod® connectivity and a USB port that allows users to charge most personal media devices, including cell phones, MP3 players, iPods® and BlackBerry® devices. Add these new features to the user-focused elements you've come to expect from Star Trac - adjustable personal fans, easy-up seat adjust, intuitive pedal straps, and personal programs developed especially for bike riders, and you have the best upright bike on the market designed with your members in mind. Dimensions: 48" X 25" X 58"